If there’s one thing that we have been learning throughout the past 3 months here in this country, it’s to have patience and be flexible. Yesterday was a learning day. This blog post is not meant to be taken as complaining, I just want to give everyone some insight into the rhythm of life on the mission field. SO. A couple of days ago Evan starts developing impatigo on his face (Apparently it’s the same thing as strep throat, it just happens on your skin…Those of us who didn’t go to nursing school would have no business knowing that.). We wake up yesterday morning and it’s in full effect on his face, spreading down his neck, and he feels awful (It’s really not as gross as it sounds… just red and splotchy). That was tip #1 that we should have stayed in bed. Then, I walk out of the house and kill a baby tarantula walking on our porch (tip #2). We had a lot of stuff to get done, though, so we had to press on. Our car battery’s dead. And the car’s parked in an anthill. Evan takes the battery out of the car, steadily being attacked by the ants crawling up his legs, and we get in Norm’s car to go get a new battery. We drive to RSJ; the car parts place is closed. The other thing on our list for the day is buying paint to repaint the outreach center. We go to the hardware store; they are out of the colors we want (I didn’t even know that happens here… I thought they would mix it like in the states….). Our next option is to drive to Gaspar Hernandez (about 20 minutes from RSJ), and try to knock out both things on our list. We get there, we buy a new car battery, no problems. Needing more cash, I go to an ATM, I put in my card, put in my pin, put in the amount, said “yes” I want a receipt, and then…. nothing. No money. No receipt. Nothing. This is an ATM on the street, not by a bank (lesson learned), so there’s no one to ask about it (The jury’s still out on whether someone stole our $300 or not). I try to another ATM (outside a bank), actually get money this time, and we go to the hardware store. The only paint color they have is white. So we go to another, and they show us all the colors and assure us that they have them all. So I tell them what I want, the guy leaves, comes back and tells me they are out of the color I want (surprise). I picked out another color, they got the paint, and I get ready to pay. It’s more than I thought it would be, so I don’t have enough cash (they don’t take a card… seriously, how do they LIVE like this? 🙂 ), and we have to go BACK to the ATM. At this point we are seriously missing the convenience of the US of A (I would have killed for a McDonald’s). Anyway, we finally got the paint, the battery, and went back to Bobita…. Only to find out (after Evan gets re-attacked by the ants, who are still furious we parked in their hill) that the car still won’t start. Evan and I honestly really love being here, and I love seeing the ways that God is changing us and using us and helping us to grow. But we sometimes just wish there were an easier way to learn patience…. I just want to share a quick little story about something that happened to me last week. Tuesday, instead of taking a day off, we went with the group (Clear Creek) to the hospital and dump to visit the people there. I will be honest and say that I was not exactly looking forward to going. It’s a really long day in a crowded Daihatsu, and it’s often pretty emotionally draining. We said a quick prayer, asking God to use us for the day, despite our not really wanting to go. When we were getting ready to leave the hospital later that day, I came across an 8-months-pregnant woman who was visiting her mom in the hospital. I asked her what she was having; she said “girl.” I asked her if the baby had a name, and she said “Not yet. What name would you give her?” I told her that I thought she should name the baby Naomi. I explained to her that Naomi was a faithful woman in the Bible, and then I told her about the story of Naomi and Ruth. I kind of thought that would be the end of the conversation, but this girl and her mom and so interested in the story, and the name, that I tried to tell them how to find the story in the Bible (I didn’t have mine with me, unfortunately…). They were asking me questions about Naomi, and they even asked me to write the name down for them. Now, I have no idea what she will name that baby, and I’m sure that I will never find out. But I can’t say that I wasn’t touched by the hearts of those women who were hungry for the word; and by the God who can use us, despite our human shortcomings. 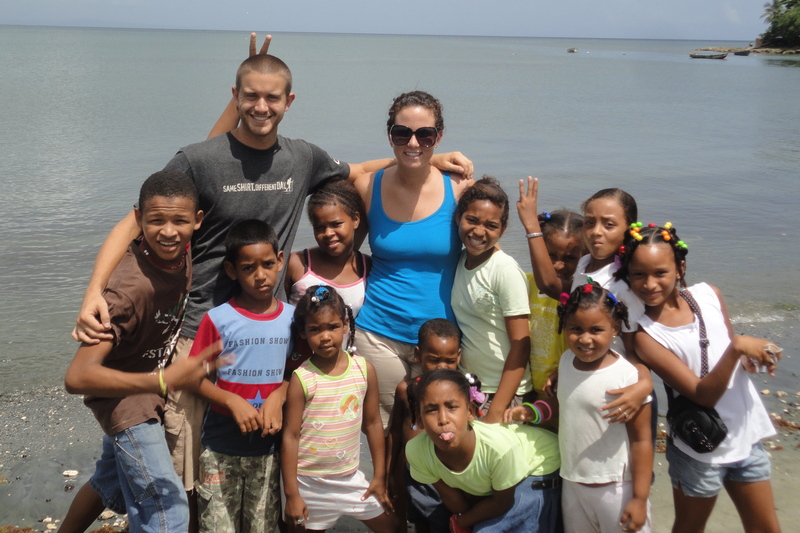 The summer groups have always done a community day, which consists of breaking up into smaller groups of about 6 or 7 and eating in the home of a Dominican. They cook lunch for the group, and everyone just spends the day getting to know one another. Well, this summer, the DR team decided to move community day from Bobita to Rio San Juan, so that we could get to know more of the families with whom we would like to work. It has really been awesome, because we have been able to meet a lot of people, inviting them to church and the children’s activities. Anyway, the more that I am here, the more I feel like we, as Americans, are really missing out on what it means to be hospitable. Yes, that even means the southerners. How many of us would be willing to invite strangers into our houses, and allow them to talk about Jesus to us and pray for our home? And even if we would do it, it would be a struggle for most of us to keep it from being unbearably awkward. For me especially, I feel like it is so hard to let go and let the Spirit do the talking through me. For that reason, I am increasingly thankful that this place continues to put me in a position to grow in that way. Here’s a picture of some of our kids from today.